Brasilia, September 2016 | ride. travel. live. This is of course Brazil’s capital, built in the center of the country, but the middle of nowhere, in a relatively short span in the 1950s, and officially inaugurated in 1960. The plan is obvious from the air as you approach the airport, shaped like a bird, or a drawn bow and arrow, with a spine of government structures spanning about a mile, and numerous structures designed by Oscar Niemeyer. It was recognized with World Heritage status in 1987. It’s a decent, but long day trip from Sao Paulo or Rio de Janeiro, with frequent and reasonably priced flights. 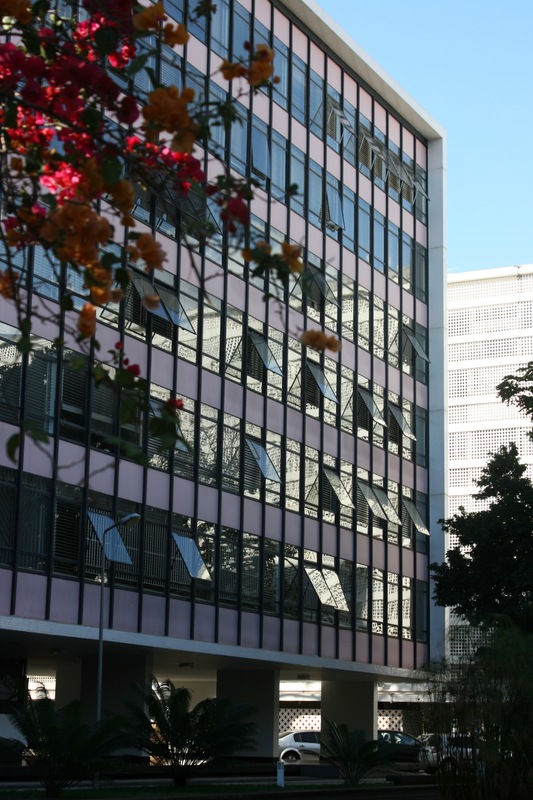 I was based in Rio, and it’s advisable to use a departure from the centrally located Santos Dumont Airport (SDU), instead of the much further Galeao Airport (GIG). I picked a 6 AM departure from SDU, a quick and inexpensive taxi ride, but ended up returning to GIG, which made for a rather long, 90 minute return bus trip to my hotel in Copacabana. It’s a 90 minute flight over a pretty barren landscape that gives you an appreciation for the task involved in building a new federal capital from scratch sixty years ago, and sprouting a city of now 3 million inhabitants. There’s a bus that stops just outside the terminal in Brasilia, which will drop you off at the major sites downtown. It’s a 20 minute ride, and I got off at the Tres Poderes (three powers), which is surrounded by Niemeyer’s signature buildings. This fairly small area is home to Brazil’s version of the Capitol, the White House, and the Supreme Court, all within about 500 m or each other. They’re also the best structures in town. I took the free tour of Congress, which was impressive, it’s the building with the skyscraper in the middle and the two domes. The interior is also very nice, with a cool collection of mid-century furniture and art and a sophisticated feel. Nearby is the presidential palace, the supreme court, and the foreign ministry. 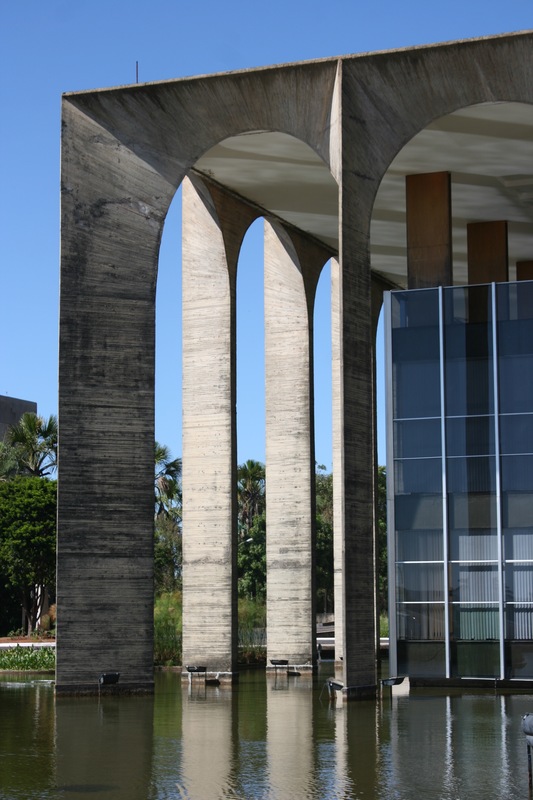 Behind it is a cluster of 1980s structures by Niemeyer, which are crumbling. I walked west, about a mile towards the cathedral. It’s not that large, and a pretty cheerful space, with a gleaming white interior and lots of stained glass. I liked it, while the building next door, the museum, was a crumbling UFO. 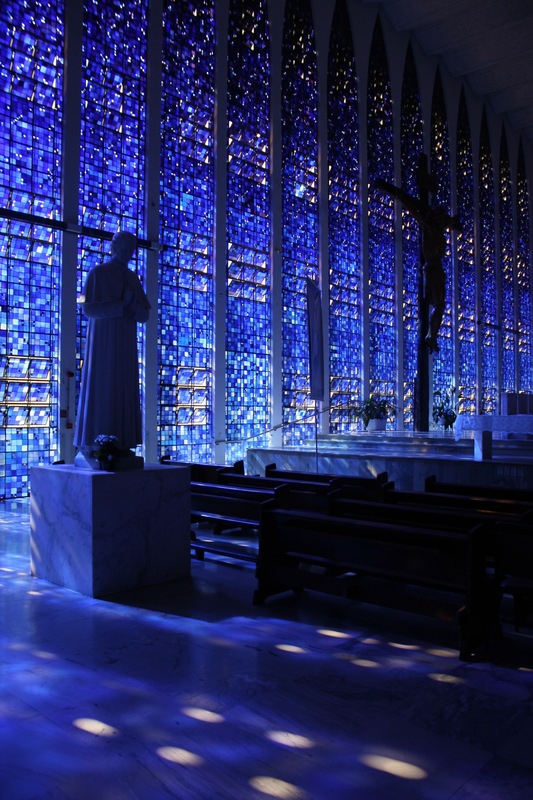 Way further afield, another mile away, is the Santuario Dom Bosco, completed in 1970, which is pretty unexceptional from the outside, but is a winner inside, bathed in light shining through blue and purple stained glass. 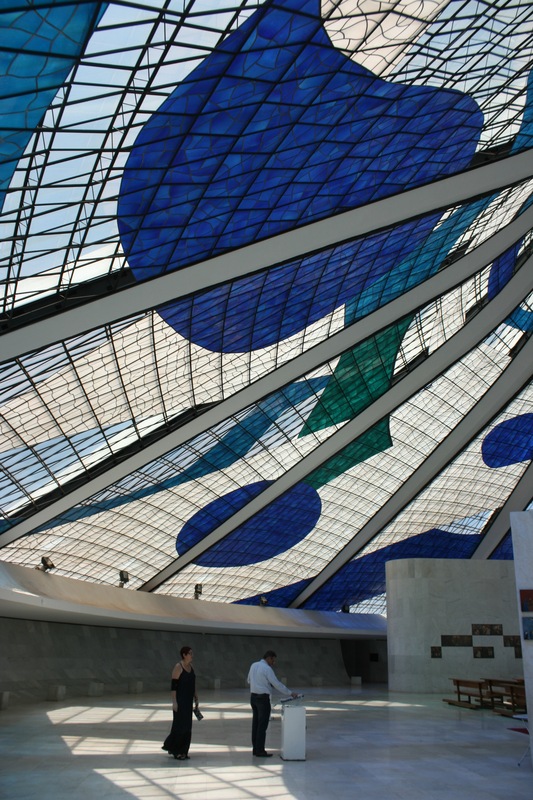 Niemeyer’s buildings elicit a visceral response. 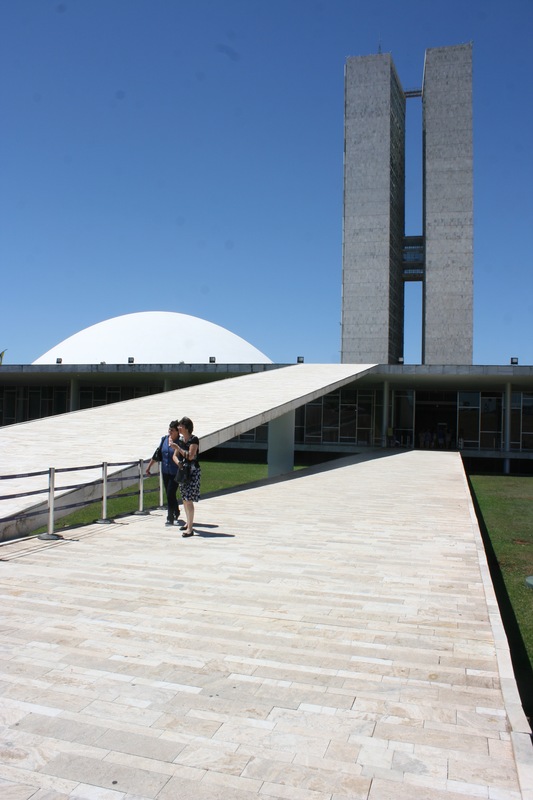 You can’t doubt the imagination that went into them, but I get this feeling that he forgot the human scale in Brasilia. It’s a bold plan on paper or in a model, but doesn’t quite work in reality. Now overall, the city comes across as being pretty sterile, with little pedestrian traffic, few places to sit and enjoy the view, and vast exposed empty spaces that are hard to maintain. Despite some very nice religious structures scattered around the city, it’s reminiscent of some of the places in the old Eastern Bloc that I’ve been to, like Chisinau. The main axis is a bit like Washington’s Mall, but with much less character, less vegetation, and really grim buildings and ministries lining the road. It’s also a very pedestrian-unfriendly city, the address system is nearly impossible for a first-time visitor to decipher, and the main social centers seem to be shopping malls. I took lunch in a mall food court after nearly starving, dodging a few six lane highways, and creepy stretches of concrete jungle to find an unmarked Brutalist structure that actually had people inside. 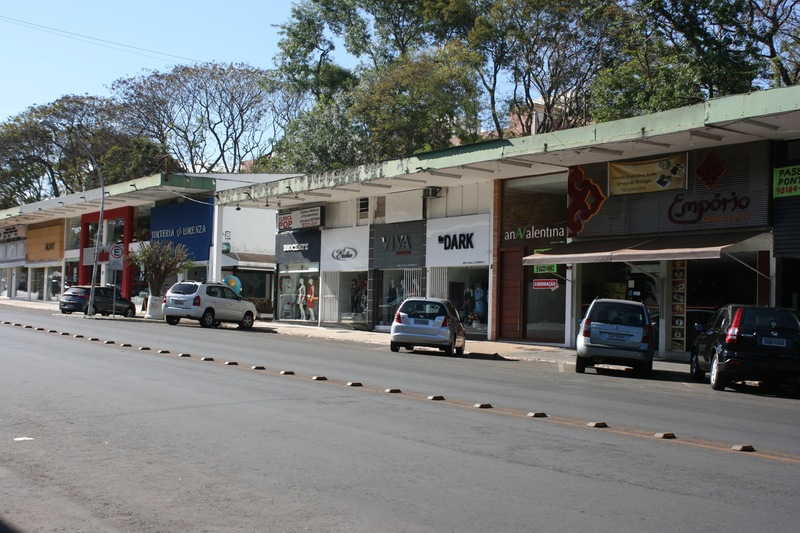 The living areas are way in the periphery, with a large slum on the western outskirts, while the original 1950s / 1960s living quarters are in generally good shape and wealthy areas, with a few of them carefully preserving Niemeyer’s intentions. Interspersed between the apartment buildings (located in these so-called Superquadras or superblocks) are lots of greenery and a small commercial zone every few blocks. It’s hard to imagine these really getting lots of street life, but they seem to have a decent selection of restaurants and markets. Downtown there’s very little in terms of services. A word about safety, since this is on the minds of most visitors to Brazil- Brasilia is quite safe, I didn’t worry about carrying my DSLR around and taking lots of photographs, unlike in Rio and Sao Paulo.